A fresh start and early mornings are here. With summer break here to stay there is no more groggy mornings where we barely make it out of bed in time. The sun shines bright and early, the boys are immediately ready for fun! 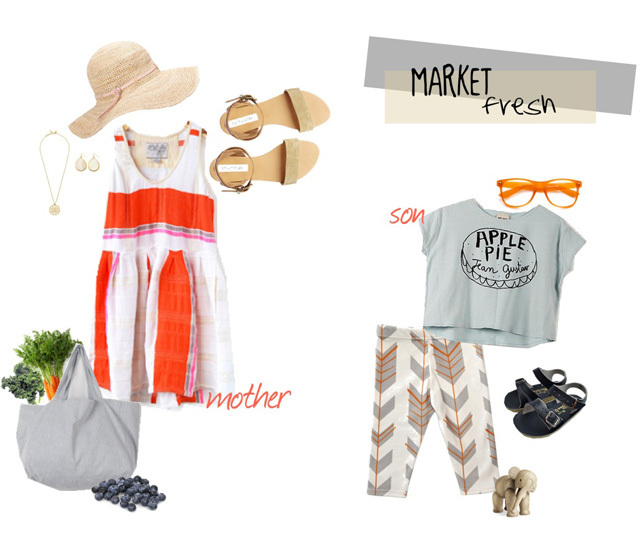 We are loving trips to the farmers market to stock up on fresh snacks for the lazy week ahead. We love our local farmers and their fresh foods, but of course the market always needs the proper attire (didn't you know there is a secret contest for who looks the most like they belong!)! These looks are channeling our summer vibes and we are ready to take the lead! We are loving the many facets of the new revolution of small businesses that are finding their way in this world of mass production! We are not talking our local farmers! We are talking about the amazing moms that are making rad clothes for our kids! I am loving the breakout of children's leggings that are made by moms! Not only do they know the latest styles, but their take on prints are whimsical and enchanting! I am obsessed with these leggings from our sponsor Salt City Emporium. I wish I could get multiple pairs of every print in their shop for my boys to rock all summer long. They are doing great things over there and I am loving all the inspiration I am get every time I pop over to their shop! Such great pieces for the crisp mornings where we head to the market, or the late nights by the bonfire - we can't get enough of Salt City Emporium and their urban style. Here are two more of my favorites in their shop the shaggy rabbits and the mountain print. Let me know your favorite print from their shop and your MUST HAVE attire when you go to the market! check them out on facebook to follow along and instagram to see great inspiration and giveaways popping up. that dress is cute! and I love love those leggings, my son, Hudson's room is grey, orange and mint. I think he needs those.